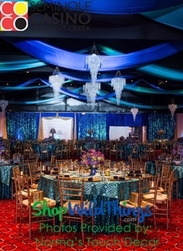 Achieve a rich, vibrant look for your next stage set or special event with our mixed bead collections of fabulous beaded curtains and chandeliers from ShopWildThings. You can see our Pussycat silver circles and silver PVC discs beads in use on our how-to videos and on the hit CBS television show Blue Bloods, starring Tom Selleck and Donnie Wahlberg. 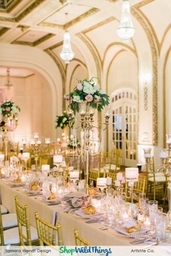 Our silver and sparkling Diamante Duo crystal bead curtains in a 35-inch width and 6-foot length have been the focal points at fabulous weddings, galas, award ceremonies and outdoor festivals, too. Add dazzle to a hallway entrance, door or window. 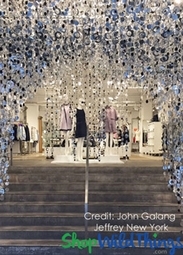 Our Kate beaded curtains combine silver PVC circles with non-iridescent clear crystal acrylic beads for a lovely look. These gorgeous curtains each have 12 strands of beads. The width is 34 inches, and they're available in 6-foot and 12-foot lengths. 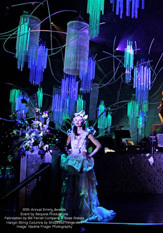 Four sizes of beads Decorate our Pussycat faux Capiz shell and Diamante Duo diamond-faceted acrylic crystal beaded curtains. Acrylic Beaded Curtain "Costa" Beige Fabric Top - 40" x 84" - Hand Strung! Acrylic Beaded Curtain "Costa" Brown Fabric Top - 40" x 84" - Hand Strung! We also have the Diamante Duo and Faux Capiz bead chandelier with an 11-inch diameter and 3.5-foot length. 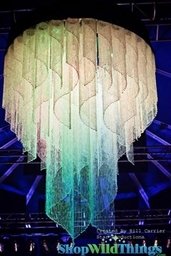 This chandelier includes a plug-in light socket kit that uses a standard light bulb rated at up to 60 watts. 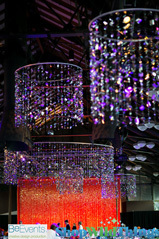 For more mixed bead chandelier looks, shop our Pussycat red discs and red Diamante Due crystal bead chandelier. It's also 11 inches in diameter and 3.5 feet long. 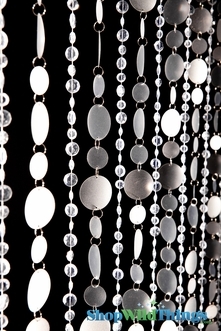 Our Luna chandelier combines bright silvery circle beads with silver disc beads.